Who's Your Mama Media | Offerings for creative mamas! Now that the dust has settled (and my nerves have mostly gone back to base level), I wanted to share the LIVE audio of my SheSpeaks story here, as it’s really the story of my journey to starting Who’s Your Mama Media. First (Re)Discovering Creativity After Motherhood Workshop Scheduled! My first in-person (Re)Discovering Creativity After Motherhood Workshop has been scheduled, for Saturday, November 3rd, 9am-12pm, at the wonderful Rosemont Wellness Center in Portland, Maine! SPACE IS LIMITED – BUY YOUR TICKETS TODAY! You encourage creative magic and self-expression for your kids, but what about for yourself, mama? The (Re)Discovering Creativity After Motherhood Workshop is for mothers who desire to pursue personal fulfillment through creative hobbies, outlets, and activities, but don’t know where to direct their focus, feel guilty taking the steps to go after their dreams, or cannot logistically figure out how to fit creativity into their already busy lives. Many of us spend much of our days (and energy) caring for everyone else, not realizing that also allowing space for our creative practices will actually result in us being able to bring our best selves back to motherhood, to our families, to all our relationships, to our work, to every aspect of our lives! In this soul-focused, interactive workshop, we will explore unpacking our expectations, reconnecting with our inner child, starting an actionable to-do list (that you will actually want to do), and enjoy a hands-on project to get those creative juices flowing! And be sure to sign up for my Stay Creative newsletter if you want to be one of the FIRST to know when MORE in-person (Portland, ME) workshops become available! The (Re)Discovering Creativity After Motherhood Workbook Now Available! Click HERE to snag your own copy (or two, or three – hand ’em out!) of The (Re)Discovering Creativity After Motherhood Workbook! At long last, and a good year-and-a-half after I first put pen to paper*, The (Re)Discovering Creativity After Motherhood Workbook is FINALLY available for purchase from Amazon! CLICK HERE to get your hot li’l hands on one of the very FIRST copies. *A perfect example of honoring one’s creativity/creative practice, even while mired in the “Fertile Void” where “nothing” seems to be happening (but actually a LOT is, just below the surface). Portland, ME (Re)Discovering Creativity After Motherhood Workshop COMING SOON! (Re)Discovering Creativity After Motherhood online class now available through Skillshare Premium – check it out HERE! Please enter your name and email in the form below. You will be the FIRST to hear future updates on these exciting offerings, and I will send you a FREE sample chapter of the forthcoming workbook – woohoo! Yes! Send Me WorkBOOK Updates! Yes! Send Me Portland (ME) WorkSHOP Updates! And, YES – Season 2 will eventually arrive! Be sure SUBSCRIBE to the Who’s Your Mama podcast on iTunes, Google Play, and Stitcher to ensure that the next episode arrives straight to your device! And, as always, follow Who’s Your Mama on Facebook, Twitter, and (NEW!) Pinterest. 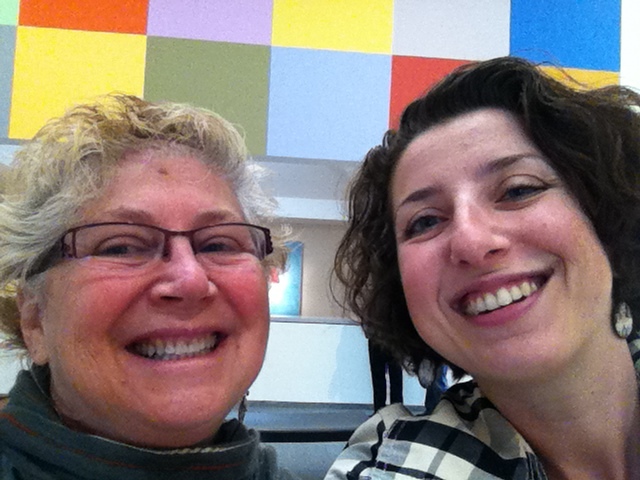 Episode 23: Lesli Weiner – former weaver and SAHM-turned-working-mom, current social butterfly and busiest “retired” person I know…who happens to be MY MOM! MOTHER’S DAY SPECIAL EPISODE! An intertwined chat with Lesli Weiner – former weaver and SAHM-turned-working-mom, current social butterfly and busiest “retired” person I know…who happens to be MY MOM! We discuss her artistic schooling and transition into SAHM…then again into working mom, how the biggest challenge for her creativity was (and still is!) “time,” memories of her mother (my Nana) and how she pursued her artistic hobbies, how all of this relates to society on a larger scale (then and now), mixed in with some delightful family disagreement with how both of us remember any of the above. Good times! And, BIG NEWS! The Who’s Your Mama Workbook for (Re)Discovery is moving along (expected due date…2017), and I just released a FREE sample section, exclusively for subscribers of my (since closed) “Inspiration Fix” newsletter! Listen and subscribe on iTunes, Google Play, and Stitcher!